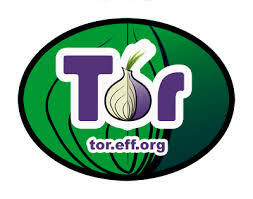 Recently a couple of articles have appeared on large US websites about a type of search engine called Shodan. This search engine has been about for about 3 years, but it is different from Google and its cohorts in many ways. I looked at it and could not understand it at all, so what is it then and why is it causing such concern? I have seen Shodan described as “The scariest search engine on the Internet”. This CNN money article explains that Shodan navigates the Internet’s back channels. It’s a kind of “dark” Google, looking for the servers, webcams, printers, routers and all the other stuff that is connected to and makes up the Internet. What interest could there be in such capability? Well a lot apparently. The system allows an individual to find security cameras, cooling systems and all types of home control systems that we have connected to the Internet. (See Christopher’s series about his British Gas system here). One serious problem is that many of these systems have little or no security because they are not perceived as threatened. Shodan searchers have however found control systems for a water park, a gas station, a hotel wine cooler and a crematorium. Cybersecurity researchers have even located command and control systems for nuclear power plants and a particle-accelerating cyclotron by using Shodan. Hacking apart it turns out that the world is full of systems that are attached via router to the office computer and web server, and on to the outside world. Access for anyone who can find them and might like to turn of the refrigeration at the local ice rink, shut down a city’s traffic lights or just turn off a hydroelectric plant. The Shodan system was designed to help police forces and others who might have legitimate need for such a tool, but what when it gets into the wrong hands. Security is non existent, just get your free account and do a few searches and see what you find. Regular readers will be aware of my interest in these types of problems through my work at the Bassetti Foundation for Responsible Innovation. I am not sure how the development and marketing of such a tool could be seen as responsible behaviour, but as I have been told on many occasions during interviews there are plenty of other ways of finding out such things. These types of systems are gathering already available information to make it usable, nothing more, so not doing anything wrong. If you succeed, others copy you. Some say that this imitation should be seen as flattery. Those who are being imitated may just think you are being plain darn rude. This is a story of how I had an idea, and that idea trued into an overnight success – with yours truly receiving nul points for it. Okay, I am over dramatising things here. Quite ironically, one of the toughest industries to succeed in is SEO, as the market is hugely over saturated with literally tens of thousands of people and firms, offering their services to help you “reach top of Google” or rank “on page 1 for your keywords” – believe what you will. Food for thought: Google the term ‘SEO’, and there are (to quote Google) “About 224,000,000 results“. Who is top? No, not the best SEO agency, but Wikipedia – naturally! Anyhow, the story goes that I had an idea, an idea to make a new image for an article. 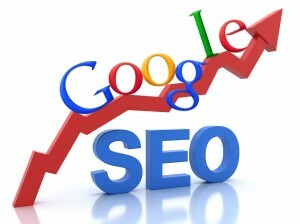 One of our writers had contributed a guest post, and in that article they talked about SEO. I thought that an interesting image to accompany the article would be an upward pointing arrow (to demonstrate improvement) and the word ‘Google’ balanced on top. I found an image off the internet, and took Google’s logo for the text, and set about making a large, high quality version of my idea. The image I created can be seen below. Quite a good image I thought. Apparently, other people like it to. After just 4 months being live on the blog, many other people have found it in Google, and the image now ranks in the top 25 images when you Google Image Search the term ‘SEO’, and the top 10 when you type ‘Google SEO’. Okay it ranks on an image search, not a ‘web search’, however I still got an image of my design and [part] creation, very high in the SERPs for a very difficult keyword. The problem was the aforementioned popularity. As I opened: “If you succeed, others copy you” – it’s true. After just a few weeks of the image being live, it had been copied, and Technology Bloggers (the image source) was no longer the site that showed up with the image, as other sites with higher reputations (in Google’s view) stole our limelight. As the images creator, I believe that when people find the image in Google and then click on it, they should be taken to our site, as without this site, there would have been no image! However we don’t show anymore. This lead me to think about stealing images. I was unhappy that other people were taking my work and passing it off as their own, and benefiting more than me because of it. However who am I to moan, as I steal images too. If I like an image I will use it in an article. Is this right? Possibly not. 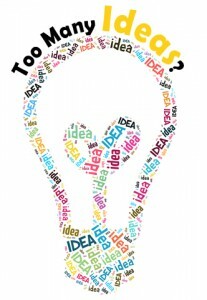 The ‘light bulb’ image I used in my post yesterday. That said, when using images, I tend not to lift the image straight off a website and put it in my post, I will usually modify it in some way first, so that the image is different from the creators version. I feel this is slightly more justifiable than just ‘stealing’ another’s work. Take the image in my post on Monday, the idea light bulb, that wasn’t my image, but I resized it and added some text to it – therefore making it a variation, not a copy. In my Google SEO image, the SEO graph image was an origional image, as was Google’s logo; neither of these images belonged to me, but I still used them. I feel that straight out lifting and pasting images is wrong, and anyone who has ever suffered because of my use of their image, I apologise, get in touch and I will see what I can do. If you modify an image in some way to make it your own, then I feel you are in a slightly different position. As you have probably gathered by now if you are a loyal reader, I [sometimes] have a mild case of perfectionism and am one to constantly tweak, change and improve. After a while I started to dislike the image I had made; the letters were a little skeewiff and the shadow at the bottom finished a little abruptly. So I went back the the drawing board and remade the image, but better. I knew if the last image was successful, and this one was better then it would probably be more popular and therefore shared even more, so I hatched a plan. I decided to watermark the image, very faintly, with Technology Bloggers web address. I don’t really like watermarking much, but it seemed to be the only option I had. Below is the new image. Notice that there is no watermark on the smaller version of the image, however if you click on the image, the big version does bear the watermark. If you want to use a small version, fine, no problemo. If you use the big version, you advertise our site – simple. That way, if the image is stolen, all credit is not lost, and hopefully, Technology Bloggers should show in the search results for the image, as we have the biggest version hosted on the site. Google is of course a tech giant and a company everyone who’s touched a computer knows of. 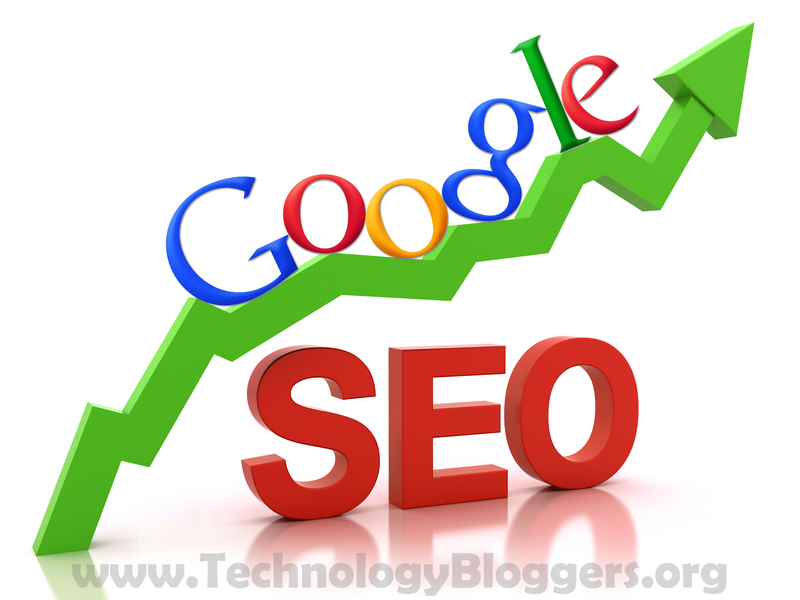 Google first introduced themselves with their simple search engine in 1998, they have very rapidly and significant progressed, by the year, into the giant they are today. From Google Maps to Google phones, tablets and OS systems, Google is now everywhere! Here’s what we can expect from Google in 2013. There is set to be a lot of development at Google in the next year and the first thing that warrants a mention is their futuristic Google-X Division. Google are working on two things that you’ve probably already heard about. The first is Google Glasses, which are wearable computers which give you a heads up display of the word around you. In the first part of 2013, developers who have pre-ordered them will get their hands on them, and therefore be able to write their own software for them and more. The chances are that we won’t see Google Glasses on the market in 2013, but we’ll certainly come a lot closer to knowing fully what they’ll bring. The Google-X Division is also working on self-driving cars. Google has received a lot of legislation passes that allows them to drive such cars on roads in various US States such as Nevada, and so you can expect to see a lot more developments in regards to this. Androids market share has soared in the last few years. It is the fastest growing operating system in the world and this poses some interesting questions on how it will develop and progress in 2013. Historically developers have been building for iOS first, and thus historically the best apps available were for iDevices through iTunes. However as more and more people buy Android devices, the question is are developers going to start developing for Android first more commonly. Google only recently refreshed its line-up of Google Nexus products, which are of course Google branded tablets and smartphones that it develops with other manufacturers. There are however, questions at the moment of how much traction on the market these devices are going to get. Is the new 10-inch Google Nexus tablet going to be competitive enough to make you sell your iPad or at the very least choose it over an iPad? Nonetheless, expect to see Google release new versions of their Nexus products this year and continue to try and compete with its many competitors in 2013. An example of a Google Knowledge Graph – Albert Einstein. Google did two really interesting things last year with search. One is that they created the Knowledge Graph which is their effort to map out connections with all sorts of different things. Now if you start to search for something, like for example, if you search for a famous actor, on the right of the screen you will see a box that’ll tell you about other actors that person may have worked with, films they featured in, as well as basic details such as their age and education. 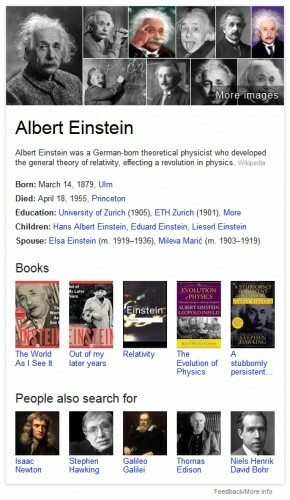 For an example, see the Albert Einstein Knowledge Graph to the right. For Einstein, Google displays images of the scientist, a brief synopses of his life/works and family, as well as books relating to him, and also similar people you might want to read about – in this case for other scientists, like the physicists Isaac Newton and Stephen Hawking. Google wants to bring its Knowledge Graph to a lot more different parts of the search experience. You’ll thus you will soon start to see more and more of those type of connections when you are Googling. The other major development the search giant was working on in the search area was Google Now. Google Now is a sort of predictive search. For example, when you take out your phone it might say you have to leave to make it to your appointment because there’s traffic right now, or you might want to go down an alternative road because a specific one is closed. This is only available on devices that run the latest version of Android right now, but Google are preparing to invest a lot more resources into developing this kind of new world of search where you don’t even have to type a query. So, like in previous years, it seems there is a lot we can expect a lot from Google in 2013.